Open, peek-a-boo stitches are all the rage with knitters and fashionistas. 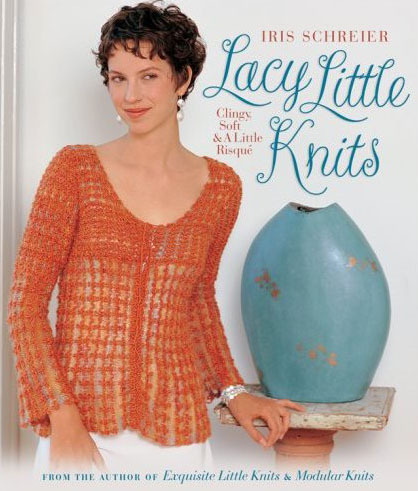 So isn’t it great to know that you can achieve that lovely lacy look without all the complicated patterns? Bestselling author Iris Schreier reveals her clever tricks for using simple, accessible techniques to mimic lace beautifully. Each of these 25 garments features gorgeous lightweight yarns, and their sensuous cling and drape evoke an aura of romance and sexiness. Wrap yourself in a luxurious pretty-in-pink Turkish Shawl. Play the role of a retro starlet in the Seashell Hat in ultra-soft green cashmere. Beat the heat in style with an eye-catching turquoise Chevron Halter. There’s even a show-stopping bridal outfit! Schreier carefully covers all the basics, from an overview of key stitches to picking up stitches in fabric, from creating short rows to adding trim, tassels, and cords.